After three years of service with the Military Airlift Command, by 1973 the C-5 GALAXY was turning into a reliable airplane. Most of the problems that had occurred in the first production models had been rectified, and the airplane was becoming considerably more reliable. It was a good thing, too, for the C-5 was on the verge of proving its value to the skeptical press. By October, 1973 all MAC C-5s had been consolidated at Dover AFB, Delaware on the East Coast and at Travis AFB, California on the West Coast. The de-escalation of the war in Vietnam had lessened the demand on MAC's C-141 an C-5 fleet. But a new problem was developing in Israel - an Egyptian/Syrian coalition had launched a two-prong attack on tiny Israel and this time the situation was far different than it had been in the past. The Egyptian and Syrian attacks were the strongest ever endured by the Israelis and even though they were meeting them, the country was depleting its supply or artillery shells at a rapid rate. With only a two-weeks supply left, Prime Minister Golda Meir turned to the United States for help. President Richard Nixon quickly agreed to come to Israel's aid, but a problem arose. The Israelis lacked the airlift to move the cargo by air and it would take at least a month for the first loads to arrive by sea. The president did not want to involve the United States military, but when the American airline industry refused to submit bids to contract to carry the cargo he had no choice but to order the Military Airlift Command to begin an airlift. The loads were to come out of several US arsenals at diverse points within the United States. 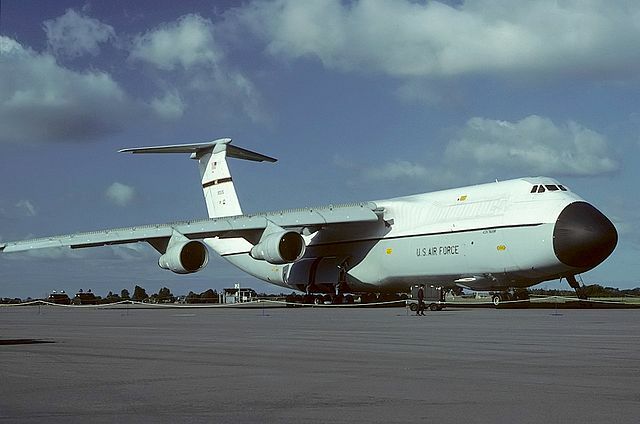 MAC immediately dispatched C-5s and C-141s from each of its bases to onload points near the various arsenals, then sent them to East Coast bases for refueling in preparation for the flight to Lod Airport outside Tel Aviv. But there was still a problem to contend with - none of the governments of the countries in which MAC's overseas bases were located would allow the American airplanes to use them while carrying cargo destined for Israel out of fear of Arab reprisals. Finally, the United States negotiated permission from the Portugese government to use Lajes, an airfield in the Azores. (Portugal had its own oil sources in Africa.) Even before permission was granted, the first C-5s and C-141s were on their way to Lajes. The airlift began in mid-October, and continued for 32 days until the first ships began arriving in Israel from the United States. Fortunately, like the Berlin Airlift, the operation was routine, though the first crews flying into Lod Airport were apprehensive due to threats of interception by the Arabs. The routes from Lajes to Lod lay in close proximity to countries that were unfriendly toward Israel. Some crews, mostly those in C-141s, reported spurious radio transmissions and some unidentified aircraft were reported during the airlift. But the United States Navy had several carriers positioned along the route of flight to provide fighter protection if needed, while the Israeli Air Force picked up each airplane 190 miles out and escorted it safely into Lod. Cargos carried included artillery shells for tanks, as well as anti-tank missiles, armor and other military cargo. Unlike the Berlin Airlift, NICKEL GRASS was a military airlift designed to prevent the defeat of a nation the United States considered to be a friend. Throughout the airlift, the people of Israel were outspoken with their compliments toward the United States and MAC in particular. The huge C-5 was a source of excitement for the Israeli population because the airplane had not been seen in Israel before. EL Al, the Israeli national airline, provided a hospitality suite at the airport for the MAC crews while a bus staffed by pretty El Al flight attendents met each airplane to offer sandwiches and soft drinks to the enlisted crewmembers, who remained with their airplanes during the off-loading process. Each crewmember was presented with a key-chain medallion as a momento of their participation. Though the C-5 was undoubtedly the star of the show, the smaller C-141 was no stranger to the airlift. By the time the airlift ended in mid-November, 1973 a total of 421 missions had brought in 11,632 short tons of cargo. The larger C-5s brought in 10,763 short tons, but had only required 145 missions to do so. El Al 707s and 747s brought in another 5,500 short tons in 140 missions. While NICKEL GRASS was going on, the Soviets were running their own airlfit to support the other side. Using AN-12 and giant AN-22 turboprop transports, the Soviet Air Force flew 930 missions into Cairo and Damascus to bring in 15,000 short tons over a 40 day period. The Soviet planes operated in close proximity to the same routes used by the MAC transports. Often the same Air Traffic Control center was controlling both American and Soviet airplanes at the same time. There were conversations between the American and Soviet crews on the radios. One thing the MAC crews learned was that their Soviet counterparts were as apprehensive of the Arabs as they were. Both sides were afraid Arab fighters would attack a MAC transport, which would prompt a retaliation against the Soviets from the Israelis. Washington had allegedly also told Moscow that if any American planes were attacked, US fighters would enter the fray. NICKEL GRASS accomplished its objective of keeping Israel supplied until surface transportation could reach the country. But it also did more. Newspaper columnists who had devoted many inches of newsprint to criticism of the C-5 in previous years now admitted that they were wrong. Though the C-141s had performed yoeman's service throughout the airlift, it was obvious that without the C-5 their effort would not have been enough. The favorable publicity lessened criticism of the airplane in Congress, and led to the appropriation of funds for improvements. MAC learned that without aerial fueling capabilities, the command would be hard-pressed to full-fill its purpose of providing rapid movement of military and cargo throughout the world. Aerial refueling training was resumed for MAC C-5 crews. MAC's airlift capabilities were further increased by the up-grading of the fleet. In the early eighties the C-5B was contracted for, while the C-141 fleet was converted to B-model status by stretching the fuselage and adding aerial refueling capabilities. Perhaps the best testimonial to NICKEL GRASS, and especially to the C-5A, is that the Soviets very quickly began working on new transports modeled along the lines of the C-5. Click here AIRLIFT HISTORY to return to Table of Contents.